Owenby Law, P. A. - The attorneys at Owenby Law, P. A. are dedicated to providing excellent legal representation and compassionate services to people facing family law, criminal, and other legal issues in Florida. Owenby Law, P.A. draws from decades of combined experience and a passion for guiding clients through tough times to provide exceptional representation in the areas of family law, bankruptcy, estate planning, criminal defense, and probate. From offices in Jacksonville, Orange Park, Fleming Island, and St. Augustine, the firm takes a client-centered approach to produce the results clients need and deserve. Call today for a free initial consultation. Attorney Joy Owenby serves clients throughout Florida with aggressive and relentless representation for a wide-range of practice areas. 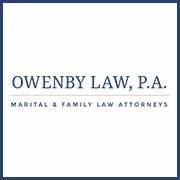 While her knowledge and experience are extensive, Attorney Owenby particularly handles matters involving divorce, adoption, trusts / wills, probate, bankruptcy, criminal defense, child support, and family law. Over the course of the years, she has obtained much recognition and has become an accomplished lawyer with an Avvo Rating. Prior to the founding of Owenby Law, P.A., Attorney Owenby serves as legal counsel for Florida’s Guardian AD Litem Program. During this time, she explored the intricacies of family law which have allowed her to guide clients using compassionate and tenacious strategies. Additionally, she served as a judicial intern for a family law judge in the 4th Judicial Circuit and as a certified legal intern in the State Attorney’s Office General Assault Division. Attorney Owenby’s level of experience is unmatched as she has learned and displayed the necessary skills for defending her clients from beginning to end. The attorneys at the Law Office of Carlos Fleites defend the right of those that are charged with a crime.